The primary election in New York provided socialists with some hints about how they might split the Democratic Party's working-class base from its elite leadership. September 13 was a disappointing night for New York gubernatorial candidate Cynthia Nixon. After a high-profile campaign covered widely in local and national press, she received just 34.4 percent of the vote — not much more than the 33.4 percent left-wing challenger Zephyr Teachout won against incumbent governor Andrew Cuomo in 2014. But the election was less disappointing for the broader forces she attached her campaign to. Jumaane Williams, running for lieutenant governor on Nixon’s slate, captured an impressive 46.7 percent of the vote against the Cuomo-aligned Kathy Hochul. Zephyr Teachout came in second place at 31 percent in a crowded field for attorney general, nearly inching out primary winner Tish James. More clear-cut victories occurred down-ballot. Thanks to Nixon’s persistent targeting of the Independent Democratic Caucus, a breakaway group of Democrats who caucused with the Republicans, handing them an artificial majority in the state senate, anti-IDC challengers swept their races. Only two out of eight IDC senators will be returning to Albany; the rest will be replaced by the left-leaning challengers. And Nixon’s fellow Democratic Socialists of America candidate Julia Salazar trounced incumbent state senator Martin Dilan by seventeen points. The mixed results of Nixon’s run mirrors the idiosyncratic role her campaign played for the socialist left this election cycle. Her endorsement by the New York City chapter of the Democratic Socialists of America played out against the backdrop of a campaign of pressure and division on the Working Families Party by Cuomo. That pressure successfully resulted in the departure of major unions from the WFP over their endorsement of Nixon: SEIU Local 32BJ, CWA District 1, and RWDSU. They followed a 2014 exodus which included the United Federation of Teachers, the Hotel Trades Council, and the Transit Workers Union over the party’s near-endorsement of then-Cuomo challenger Zephyr Teachout (though some of these unions returned after the election). The community organizations and worker centers that remained to make up the new backbone of the WFP now face existential risk, with much of their funding cut as retaliation for supporting Nixon. All the more amazing, then, that they stuck by their decision and continued to challenge Cuomo. In this situation, DSA’s endorsement was important not so much because of Nixon’s political bonafides. Rather, it was a test of whether the organization could put aside its differences to unite with progressive community organizations when they were under attack for standing up to a common enemy. At the same time, Nixon’s struggles with labor demonstrated in dramatic fashion a key problem for socialists now: that just at the moment “left politics are both popular and ascendant,” as Miles Kampf-Lassin recently put it, they’re more estranged from organized labor than perhaps any other point in history. This was a feature throughout Nixon’s campaign. She started off on a bad note by commenting, regarding the woeful state of New York City’s public transit, that “with the deals that they [unions] have now, you can’t hope to make improvements to the trains in a fiscally responsible way. Everybody’s got to pull together, and everybody’s got to make sacrifices.” In the immediate aftermath, it was tough for even the most diehard Nixon supporter to interpret these comments as anything other than a call to attack transit workers’ contracts as a solution to the subway’s woes. Overnight, Nixon walked it back, clarifying that she was actually discussing the corrupt construction deals that hamstring repairs and maintenance. But this explanation was too obscure to gain any traction. Of course, anyone who understands New York politics could have predicted that the majority of labor leadership would go with Cuomo no matter what Nixon said or did. Nevertheless, candidates should be careful not to overestimate the labor bureaucracy’s sway over the views of their membership — or underestimate the rank and file’s independent power to mobilize one way or another. Members are largely alienated from their unions’ political decisions; they often put little stock in some political director’s argument about the way to go. Still, it’s likely that hours after Nixon’s original comments hit the press, they were reproduced on hundreds of unions’ Facebook groups and personal pages, and that it permanently poisoned her credibility with a rank and file that were in no way primed to be loyal to their union’s endorsement. Even if members saw and believed her clarification, the affair revealed an ignorance about how her words would be received by rank-and-file union members. It is to Nixon’s great credit that she later adopted a labor platform crafted in its majority by NYC-DSA’s Labor Branch. This episode demonstrated one of the big advantages of electoral politics for socialists: its potential to force Democratic Party leaders to respond to our arguments, and as a result, show where they really stand. One of the platform’s key demands was to establish the right of public-sector workers to strike in New York state, which is restricted by the state’s Taylor Law. What happened next was extraordinary. Cuomo immediately took issue with the demand, saying it would cause “chaos” if public-sector workers could strike. Surprisingly, Mayor Bill de Blasio, whose leftish wing of the New York Democratic Party previously appeared as Nixon’s natural home, sided with Cuomo. The responses showed that whatever the intent of the Nixon campaign, its effect was not uniformly to “move the Democratic Party left” or to “realign” it. In this case, it forced a “left-wing” mayor to choose sides. De Blasio chose to tack to the center. In the process, De Blasio and Cuomo exposed the stakes, for mainstream Democrats, of adopting socialists’ positions. They showed that the tightrope of gesturing left while maintaining establishment support is thinner than it appears. De Blasio is supposedly feuding with Cuomo, but he put this aside to show Nixon she had gone too far. Repeat this scenario again and again, and you’ll start to see a polarization between the party’s leadership and its working-class base. This is a good thing for the socialist left. We shouldn’t be trying to realign the Democratic Party, but we have to recognize that the vast majority of the base of a future left-labor party lies within it. Our best hope is to foment unrelenting conflict between the party’s base and its leadership, making the contradictions between the two unbearable while building that base’s independent political and mobilizational capacities through rank-and-file labor work, issue campaigns, and more. This would serve two purposes. First, to organize that base towards an independent political pole rooted in socialist politics. Second, to force party elites to articulate their real program — in all its pro-corporate, anti-worker glory — and, hopefully, transform the Democratic Party into a traditional, “externally mobilized” party in an attempt to discipline and purge its internal dissidents. A major party taking this step would in turn fundamentally alter the two-party setup of American politics. Already this election cycle prompted New York state senator Diane Savino to call for the abolition of fusion voting as a means of disciplining the Left. That would be bad. But as an alternative, she suggested instituting nonpartisan elections. If party elites pursued this path — which they’re unlikely to do in the near future — it would be a major fluke in favor of the Left, of the type that the Labour Party’s switch to a “one man one vote” (OMOV) system was. That switch was introduced by the Labour right in an attempt to outmaneuver the Left but, ironically, served as the structural change that overnight made Jeremy Corbyn’s rise possible. Nonpartisan elections in New York could have a similar effect. Of course, the type and level of conflict within the Democratic Party required for such a strategy is not likely to be spearheaded by figures like Cynthia Nixon. The extent to which it occurred was mostly due to the socialist left’s presence. We should prioritize building our capacity to run our own candidates on our own terms. But in the meantime, when ideologically mixed candidates like Nixon are open to us steering their campaign, it allows us to temporarily pose a greater challenge to elites than what we’d be able to pull off on our own. The right-to-strike demand also performed two other functions. First, the demand itself — propagandized from Nixon’s huge platform — helps “cohere a distinct and consistent collective political identity” among the base we hope to organize. 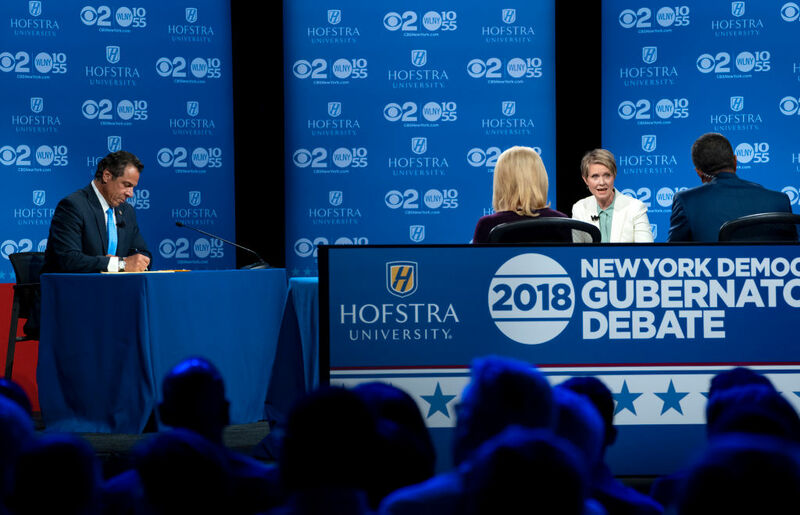 During the televised primary debate, Nixon argued that without the right to strike, “there is no real way for public-sector workers to get a better contract other than cozying up to someone like Governor Cuomo. And I think that labor unions need to have more independence.” Those public-sector union members that identify with this argument will also start to identify with the conception of power that informs it — and their own importance in it. In an ideal world, we would already have a much more serious presence in public-sector unions that would have allowed us to immediately take advantage of the organizing opportunities opened up by this debate. But it at least primed this audience to be receptive to our conception of militant rank-and-file unionism. It is true that socialists have little hope of capturing labor leadership, at least right now. But that doesn’t mean we should write off labor or try to replace it with some other base. It means we use the tools we have to create organizing opportunities among the rank and file to rebuild the kind of democratic, militant, and politicized unionism that can be the backbone of a movement to effect far-reaching change among society. If we don’t do this, the Left risks becoming a kind of paper tiger that’s able to mobilize in short spurts to win elections or demonstrate our numbers against the Right but has no rooting in a coherent base with structural power. Left-wing politicians will adjust their and voters’ expectations downwards, out of a correct assessment that they can’t go far without a base that can strike and mobilize in key parts of society to push demands. Those politicians will instead start to lean on other sources of leverage, like transactional relationships with Democratic Party elites. Either that, or they’ll be completely isolated, and the small extent to which we’ve been able to break out of marginalization will be rolled back. All that said, Nixon played an indispensable role for the Left in this election. With Julia Salazar, DSA was already positioned to act as the left pole of a wider mobilization — represented by No IDC, the WFP, and the Indivisible milieu — targeting New York’s conservative incumbent class. But this mobilization lacked something at the top of the ticket that could cohere and politicize it at all levels. By connecting the anti-IDC races to her own fight against the governor, Nixon made an isolated fight against conservative senators into a wider political fight against the status quo in Albany. This served as a counterweight to some of the individual challengers’ tendency to push a narrative that was more anti-Republican than anti-establishment. Her endorsement of Julia Salazar was a significant factor in Salazar’s eventual victory, in a situation where a loss would have been seriously damaging and demobilizing. And her insistence on identifying as a democratic socialist, while not altering the actual mainstream Democratic character of her slate partners, forced the press, New York’s political class, and that slate itself to reckon with the Left’s idea of what those forces should be. At the base of these jockeying players are the hundreds of thousands who voted for Salazar, Nixon’s slate, and the IDC challengers; and their unmistakably left-wing program. Those voters make up the shadow of a labor-party-to-be. It will be a decade or more of work to make that a reality. But in the meantime, for the sake of keeping that voting base cohered and politicized, we must insist on all these elements striving to be more than the sum of their parts. For all its drawbacks, in a temporary and limited way, that is what Nixon’s campaign — and the socialist left that influenced it — accomplished. Ella Mahony is an assistant editor at Jacobin .